iW got a chance to sit down with record-breaking skydiver and Zenith Ambassador Felix Baumgatner at BaselWorld 2013 this week. 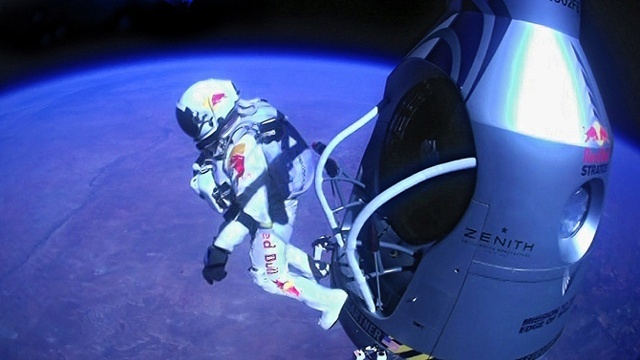 Baumgartner last Oct. completed his record-breaking jump for the ages from the edge of space. The 43-year-old Austrian skydiving expert also broke two other world records (highest freefall, highest manned balloon flight), leaving the one for the longest freefall to project mentor Col. Joe Kittinger. Baumgartner landed safely with his parachute in the desert of New Mexico after jumping out of his space capsule at 39,045 meters and plunging back towards earth, hitting a maximum speed of of 1,342.8 km/h through the near vacuum of the stratosphere before being slowed by the atmosphere later during his 4:20 minute long freefall. Baumgartner is the first man to break the speed of sound in freefall, and he set several other records while delivering valuable data for future space exploration. His jump lasted 9:03 minutes and was watched by millions of people around the world on television broadcasts and on the Internet. At one point during his freefall Baumgartner appeared to spin rapidly, but he quickly regained control and moments later opened his parachute as members of the ground crew cheered and viewers around the world heaved a sigh of relief. The Manufacture Zenith is very proud to have been the official timekeeper of this mission and to present the El Primero Stratos Flyback Striking 10th Tribute to FelixBaumgartner, Zenith President & CEO, Jean-Frédéric Dufour said. Thanks to him, Zenith El Primero Stratos Flyback Striking 10th is the first watch ever to cross the sound barrier in a near space environment.